Hubbards muted introduction gives a false sense of reassurance. One reviewer commented that his quirky original take on the jazz standard On Green Dolphin Street warranted it be renamed On Green Dolphy Street. There are Dolphy fireworks here as in all his titles, perhaps with some more conventional bop musical settings – nothing very weird about Hubbard and Byard, Haynes and Tucker, and without Dolphy you would have an oustanding Freddie Hubbard quartet bop record. The contrast of purpose between Dolphy and the supporting musicians enriches the music without threatening to tear it apart. Dolphy’s fiercely original style of improvisation, the dissonant fanfare, an off-kilter melody, the subversion of the clarinet, his alto a cauldron of snaking lines running from one register to another, liable to dart in any direction, the exuberance and the passion is all on display. 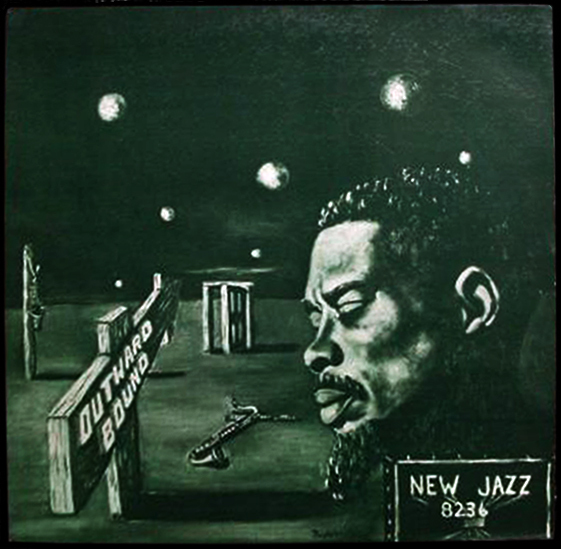 The 1960 liner notes declared Outward Bound as the “new direction for jazz”. For once, the record company hype was right. If one group of beats were wont to breathe Cool… another group would now reach for a new exclamation: Far Out! Cover: What else is there to say. Who wouldn’t prefer the original masterpiece? RVG machine stamp. Both sides have the very faintest capital letter “B” hand-written with something like a fine needle, near 11 o’clock on the A side and 1 o’clock on the B side below. It is not a reference to A and B sides, nor is it the “AB” commonly seen on several European-licensed and some US Prestige titles. Probably nothing. Regular LJC readers will know this is not a “Gosh, look how much X Y Z sold for! !” site, however you are warned this is one of those rare exceptions in which money is an integral part of the story. Readers on food stamps, living from week to week on pay-day loans, or depending for the mortgage payment on Aunt Martha not making it to the end of the month may want to turn away now. I had been after this record for many years, and always it slipped from my fingers every time, outbid at the last-minute by deeper pockets. 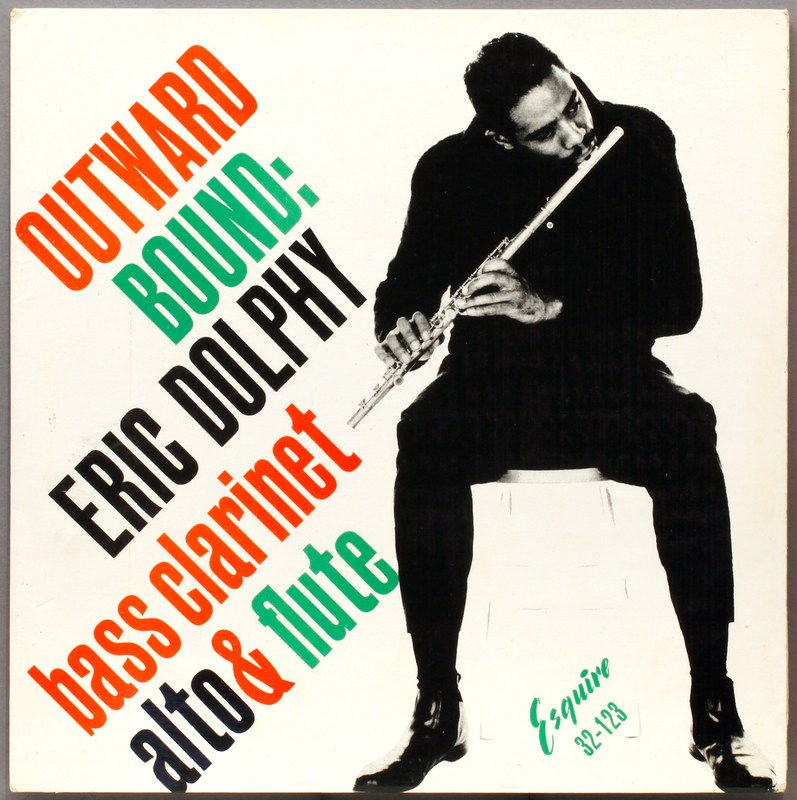 There are only two ways to go with this Dolphy title (apart from the OJC, the Transatlantic or the Metronome editions) – US original New Jazz release, or European original release – in my case, Esquire, if you can live without that beautiful New Jazz cover. Both editions are crippling expensive due to Dolphy’s god-like status . 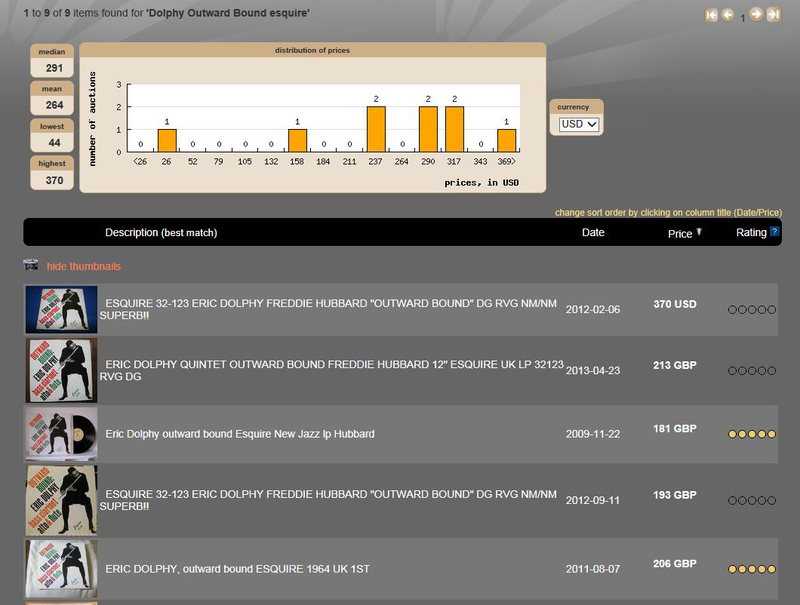 As with Rollin’s Saxophone Colossus, the Esquire release of Outward Bound has a following from collectors in the know, as a result of which it is one of a handful of the most desired and expensive Esquires, commanding commonly up to five times the cost of other Esquire editions. Now, the top five of Esquire auctions of the same record – only one or two copies a year come to market (UK Ebay sales denominated mostly in £GBP though buyers are often from overseas), a reminder of how small the jazz collector community is – for a planet of three trillion people. Perversely, the fewer times it comes to auction, the more intense the competition when it does. 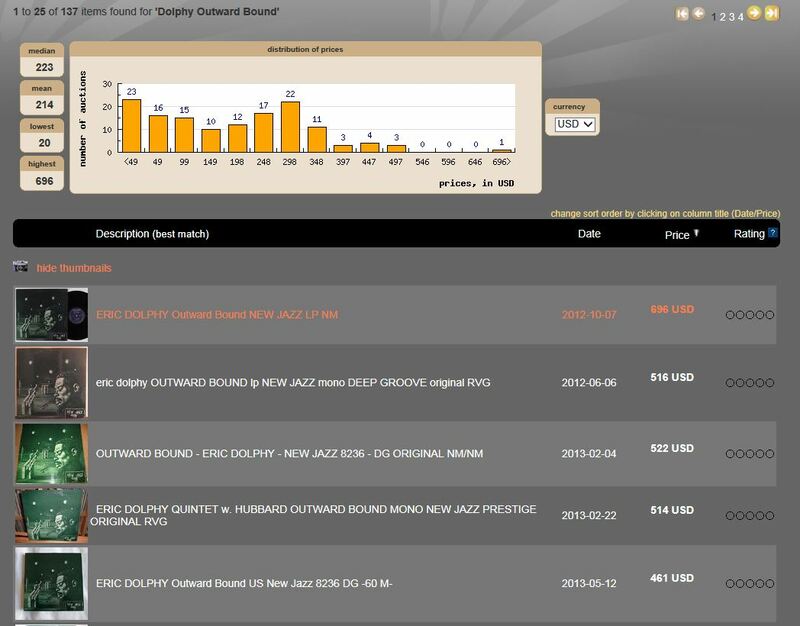 Note three of the top five auctions claim the Esquire is DG (Deep Groove) Ha ha! Should have followed LJC – a watertight ebay case for “not as described” – renegotiate the price. I was the outbid on a number of those auctions, and it is way over my usual house limit. Under circumstances it’s perhaps best not to go into here, I chanced on someone selling a copy of the Esquire Outward Bound. We agreed a price by exchange of email, and at that point, needed to organise the actual execution of the transaction without any of the guarantees or security of Ebay and Paypal – a timely reminder how those things take the stress out of buying and selling. As both of us had access to London, we agreed the best solution was a face to face meet, which is what we did. This was one of my few face to face substantial cash purchases. A date, time, and location for the exchange was agreed, at a London rail terminus in the City, close by the river Thames. It didn’t help that the week before I had been re-watching one of my favourite movies “Ronin”. There is a scene, set in Paris, where Robert de Niro’s gang, who are seeking to buy weapons for a heist, meet with gangsters at a pre-arranged deserted riverside location to exchange the money for the guns. It is a set up, of course: the gangsters have a hidden sniper on the bridge. The exchange goes badly wrong, bullets fly, and bodies go down everywhere. As I emerged from the riverside London tube station, cash in pocket, I kept scanning the rooftops to see where the record seller had positioned the sniper. Action movie descended into farce as it turned out the agreed meeting station had two entrances and I had found my way to the wrong one. Texts rather than bullets flew back and forth, advancing mobiles in hand “Where are you?” “Walking towards you” “Can’t see anyone yet” “I’m wearing a blue blazer carrying a record – can’t be many people match that description here”. – Wait, yes, wave – Hi! The seller turned out to be a personable young man, and we sat and chatted animatedly about music and records for some time before concluding the transaction. The vinyl was, on inspection, as near perfect as you would have hoped, and of course you are not depending on someone else’s grading as you can see it for yourself. The cash in the envelope didn’t have white blank cut sheets behind the first banknote, as in the film. It wasn’t that much anyway really. Everything went perfectly, and everyone was happy, except possibly Ebay and Paypal. Altogether, it was a much more satisfactory experience than waiting weeks for the postman to call, or not, for something that may, or may not, live up to your expectations. More business should be done this way, though of course, you can’t always rule out the possibility of a sniper on the rooftop. 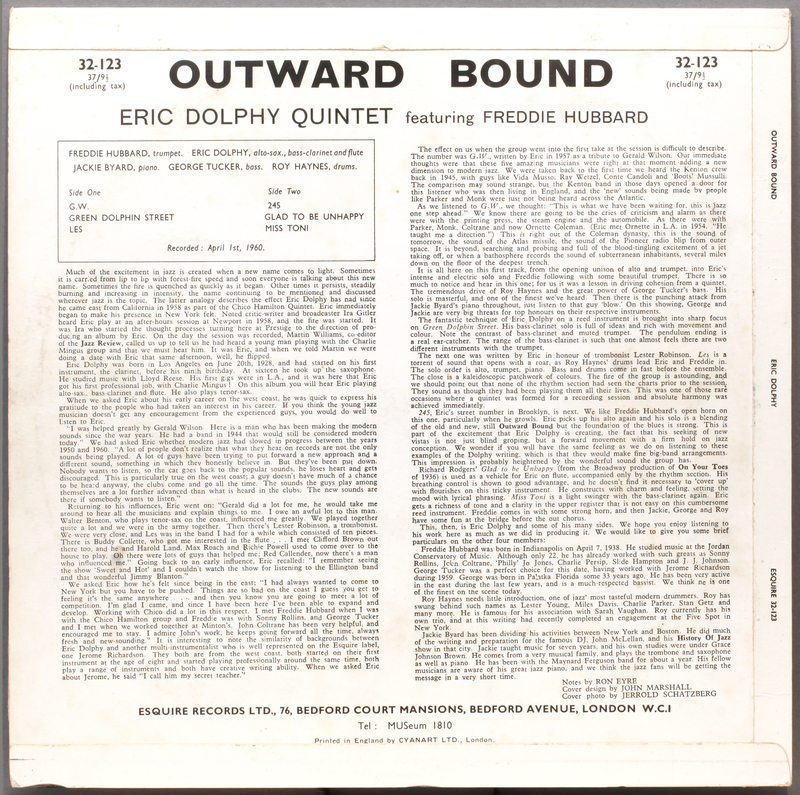 This entry was posted in Eric Dolphy, Esquire and tagged Eric Dolphy, Esquire, Freddie Hubbard, George Tucker, green dolphin street, Jaki Byard, New Jazz, Roy Haynes by LondonJazzCollector. Bookmark the permalink. Hi all, I recently aquired a copy of this album on Esquire. Not muint, some surface scratches but pretty good nick on the whole. Where is best place to sell? Ebay to secure best auction price, or Discogs if you want to try a fixed price offer and are in no hurry. It is a valuable record (maybe in the region of £150?) Record stores will pay around third of its value. Thank you for the advice. Ebay it is then! Holy cow! I have a mint copy of the Esquire Dolphy and had not realized that it is worth that much. Got it cheap a few years back. I have no knowledge of Esquire and on superficial observation, they seem to be cheaper/poorer quality versions of the original US press. I have a no. of Esquires. How do you compare the sonics of the Esquire versions vs the originals? Hi, your good fortune to have those Esquires. How do they compare? Audio-wise, unusually, they were pressed with metalwork derived directly from Van Gelder masters (in most cases the Prestige or New Jazz original is an RVG) and they sound for all practical purposes the same, no reason for them not to. They are not remastered locally from copy tape, which was the more usual manufacturing practice for international licensing. To collectors however they are not as sought after as the US originals, and command only a half or a third of the price at auction. They were all pressed on regular heavy vinyl (by Decca, I believe) so none are occasionally tainted with recycled vinyl, as were a proportion of New Jazz and some Prestige editions, so they can sound better. Their alternative cover designs are lame in my view, though some people seem to appreciate them. Don’t forget about the Analogue Productions 33 or 45 RPM. Nice and clean and sound pretty good to me. Oddly, I recall no snipers — rooftop or otherwise — when I bought my Prestige two-fer (remastered by RGV and issued in 1972 and containing both OTWARD BOUND and OUT THERE) for, I think, £4.99 from the secondhand section in the now long gone Jazz and Swing Centre in Loveday Street in Birmingham…. Oh, and it’s mono. Sounds fine to my ears (OK, my ears are nothing to write home about) and I rather like Prestige two-fers. Anyway, my chores are done and right now I’m listening to solo piano free jazz by Howard Riley on THE OTHER SIDE — a white label version as it turns out (not that I knew that when I bought it in the week, and not that it makes much of a difference). Before that bait of Dolphy, and before that another new purchase — Sun Ra’s glorious JAZZ IN SILHOUETTE. As Cook and Morton say, a timeless record that could have been recorded any time between the 40s and the late-80s. Marvellous, and a record I shall play again before the day is out. After the Riley, vol two of WILDFLOWERS, the NY Loft Jazz Sessions recorded at Rivbea, Sam Rivers’ loft in downtown Manhattan in the early 70s. I wanted this one for. The side of Anthony Braxton it has. And then perhaps the very hard to find STRANGE SERENADE, Andrew Hill’s trio on SOul Note, another recent find. But the great news is this: completely unexpectedly, and for the princely sum of twelve quid, I have just found a copy of Martial Solal’s Sans Tambour Ni Trompette (Without Drums or Trumpets, I believe, and even that stretches my French to its limit) — one of the wily old French improvisor’s most graceful and cunning records, just piano and two bass players. It sounds, as cook and Morton say, like Debussy dancing with Art Tatum. I never expected to find a copy — ever. After watching the price for this soar into the stratosphere on several occasions I picked up the Transatlantic which I find to be of perfectly acceptable sound quality. A little thin perhaps but detailed enough and very nice for the price. The Transatlantics are remastered from copy tape and they sound pretty good, I have many. I just happened to be listening this afternoon to a UK/US grudge match – Booker Ervin’s Space Book on Prestige Blue/silver trident vs the UK Transatlantic . I went in with an open mind – I have and paid for both. The US edition absolutely wiped the floor with the UK Transatlantic. Painful to admit but I hear what I hear. I am trying to rationalise this. It is a priority to get a vinyl. After that, I fear the copy tape UK releases are often inferior. But if you can’t get a US, who cares? Something is better than nothing. Yes I recently scavenged a copy of Sonny Boy on Blue/Silver US Prestige and the sound fairly rips out of the speakers. Wish I could afford more or even better the original pressings but well, life isn’t fair. The Dutch orange labeled Prestiges use the same Van Gelder stampers as the Esquires and the original Prestiges. And can be found for around 20 euro’s in exc. condition. I don’t don’t see them a lot on Ebay but here in Holland they are pretty easy to find. So if you stumble upon one. Give it a try, you won’t be disappointed. Another affordable alternative is the second US pressing on Prestige 7311 (not sure if the gold or blue label mono is earlier) which was pressed from the New Jazz stampers with the original catalog numbers scratched out. For folks that prefer stereo, PRST 7311 with the gray label was the first appearance of this title in stereo (true stereo, not re-channeled) and was also mastered by Rudy with VAN GELDER and STEREO stamped in the deadwax. There’s something quite African about the font color (although the chartreuse is a tad off kilter). It, along with its placement, is the allure of the Esquire pressing. Nicely done. In my case, the Envy Rating scale for this killer, should have at least ten smiles, ALL GREEN. I’ve updated the post with an exclusive rating, just for you. Well done Mr. LJC ! I’m after this masterpiece since a long time, it’s my white whale! Mr. Dolphy blowing in that bass clarinet stimulates undiscovered areas of my brain giving me physical pleasure, and this record is placed in my personal top 10 ever!